Imagine a high-end hotel transformed into an art gallery with mobiles hanging in entranceways, sculptures grouped on end tables, and paintings draped on easels made of bed pillows. 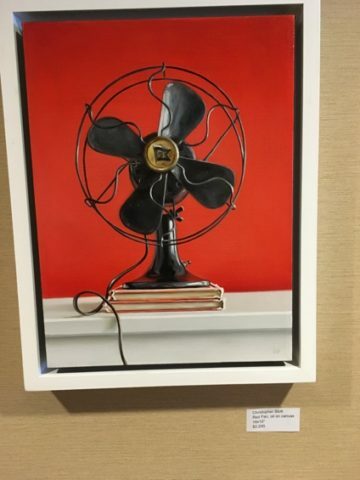 Creativity and artistry practically bounced off the walls at the Hyatt Regency in Jersey City, last weekend, when artists exhibited their works, and networked with other artists and art-lovers. On Friday March 15 and running through Sunday, March 17, the Hyatt Regency on the Jersey City waterfront was where 50 galleries booked rooms on two floors of the hotel, hung original art on the walls and flung open the doors to art-lovers. 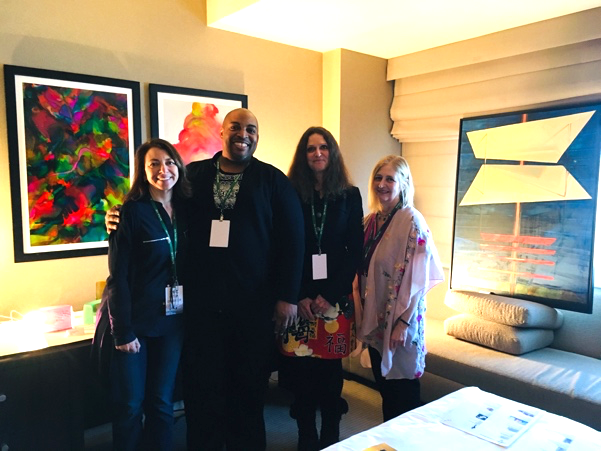 Guests had the opportunity to roam the hotel’s 8th & 9th floor and visit the galleries that exhibited some terrific paintings, sculpture, mixed-media and more in their respective hotel rooms. 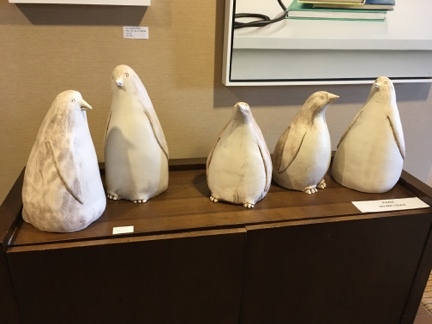 There was the group of “Penguins” by sculptor Barbara Fiore; the true-to-life “Red Fan” by Christopher Stott, and alcohol art paintings by Bryant Small. 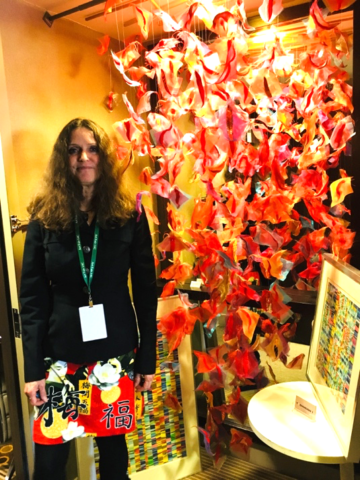 Members of Pro Arts in Jersey City, including president Mollie Thonneson, showed their work including Thonneson’s colorful hanging sculptures that fluttered gracefully when someone walked by. As groups of art lovers strolled through Pro Arts exhibition, Thonneson said that her experience at Art Fair 14C was extremely positive. She was joined by artists Linda Streicher, Bryant Small and Christine Barney. The event was sponsored by the Jersey City Arts Council and curated by volunteer Executive Director Robinson Holloway, the founding Chair of the Board of Trustees of the Jersey City Arts Council who stepped down in January 2019 to run Art Fair 14C. Holloway created and runs two non-profit art galleries – the Gallery at 350 Bleecker in New York City, and Village West Gallery on Newark Ave in Jersey City. 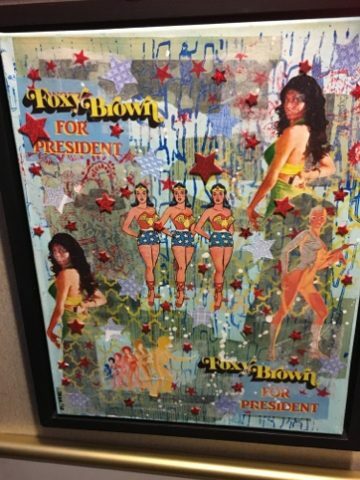 Jersey City artist Theda Sandiford exhibited collages like her “Foxy Brown for President” piece. 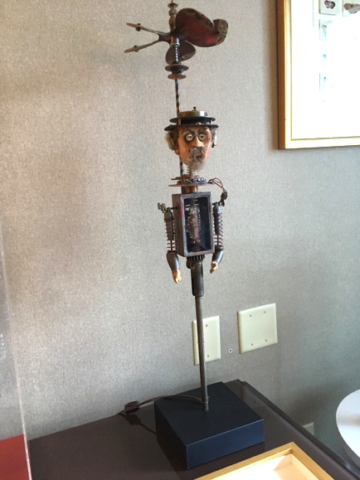 David Barnett, who creates 2D-and-3D collages and sculptures exhibited several works including a dog with mechanical parts he created as an homage to his pup, Oscar; and a mechanized man in a hat.